Magician Jason Fun offers FUN Magic Shows for your child's birthday! In each birthday magic show, magician Jason Fun will help your birthday child feel like a STAR! Your child's name becomes the Magic Word for the day, and your child will help with several magic tricks! As a gift, your child will also receive a special Magic Gift to help him/her learn some fun and easy magic tricks! Jason's magic shows also include his famous Bigger Wands routine, where your child helps him on a magic trick and ends up holding several large Magic Wands! It makes for great pictures and a very memorable time! ​Are you having a Harry Potter themed party? Let Jason know and he will perform some tricks with a Harry Potter theme and even wear his Hogwarts House Robes! Just in case you're wondering, Jason is a Ravenclaw! 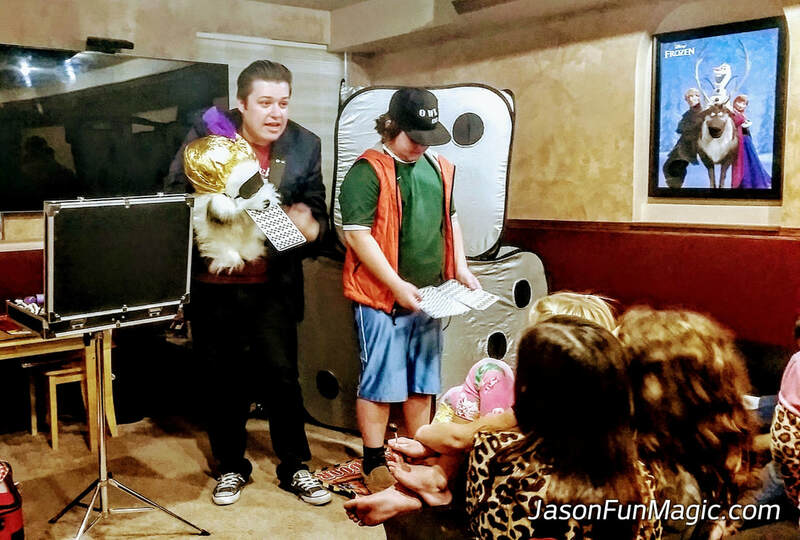 Whether you choose a Fun 30 min Birthday Show, or an hour long Birthday Magic Class, your child is sure to never forget their Funbelievable Magic Birthday Party with Magician Jason Fun! If you have something else in mind, Contact Jason now and he'll make a custom show for your party! Magician Jason Fun can provide a FUN Magic Show to celebrate your child's birthday! Choose between a 30 min show, or a 50-60 min show! 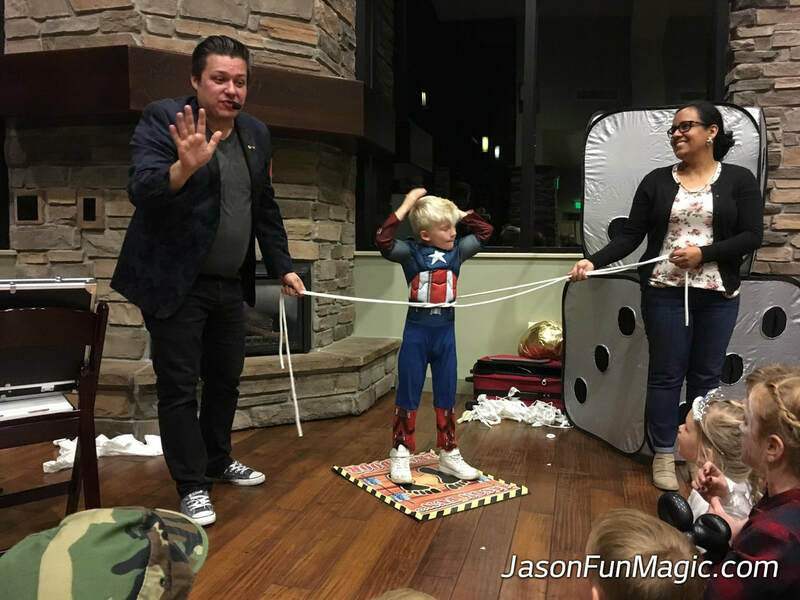 Jason keeps the magic age-appropriate, so let him know the age of the birthday child and of your guests, and your child will have an Amazing Magic Show to remember! Your birthday child will receive a Magic Gift with easy and fun magic secrets and tricks that they can learn and perform themselves! All kids at the party also receive a Magic Fun Page, that has some fun magic themed puzzles, games, and brain teasers! Great for ages 7-12! Magician Jason Fun offers a Magic Class for Birthday Parties! 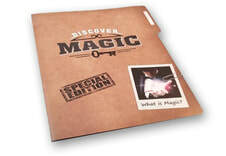 Your child will be the STAR as the whole group learns some of magic's most guarded secrets! Your party guests will lean easy and Fun Magic Tricks that they can do with everyday objects, and learn that the secrets behind them are things like science and art, and that math can even help us to read minds! Each child at the party will receive a Secret File Folder with the magic secrets, so they won't forget the secrets, and they will also receive an exclusive Magic Trick that we'll practice with during the show! About 60 min Magic Class, includes learning several magic tricks, a Secret File Folder for each child, and a Magic Trick for each child! All Fun Birthday Shows include Jason's famous Bigger Wands routine! Your Birthday child will have a blast carrying all those giant wands, and the rest of the kids at the party will go crazy watching! Great photo opportunity to remember the show!! !